When it comes to the West, there is no better way to see it than from the front seat of a car. Planes and trains might get you where you want to go, but there’s a sense of adventure and freedom about jumping in the car, filling the gas tank, cranking the tunes and hitting the open road. Justin and I had the destinations in mind and only a few reservations anchoring us down. And though each leg of the trip had something special to see, do and experience, we were at the liberty of whatever came our way! We began our trip in Jackson, Wyoming, where we stayed at the bespoke luxury resort, Amangani (read more, here). From Jackson we made our way Southwest to Under Canvas in Zion, where we spent the last leg of our trip. If you are looking for an excursion out of the ordinary, this is it! 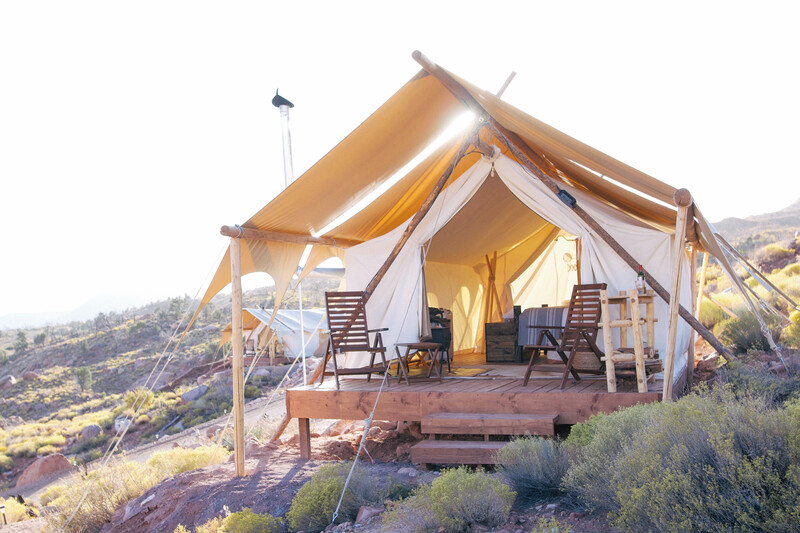 There are currently five Under Canvas camps located throughout the United States: Grand Canyon, Moab, Yellowstone, Glacier and Zion. In summer 2018, Under Canvas will open its sixth location, Great Smokey Mountains, in Gatlinburg, Tennessee. Our experience began the moment we turned onto 3955 Kolob Terrace Road. 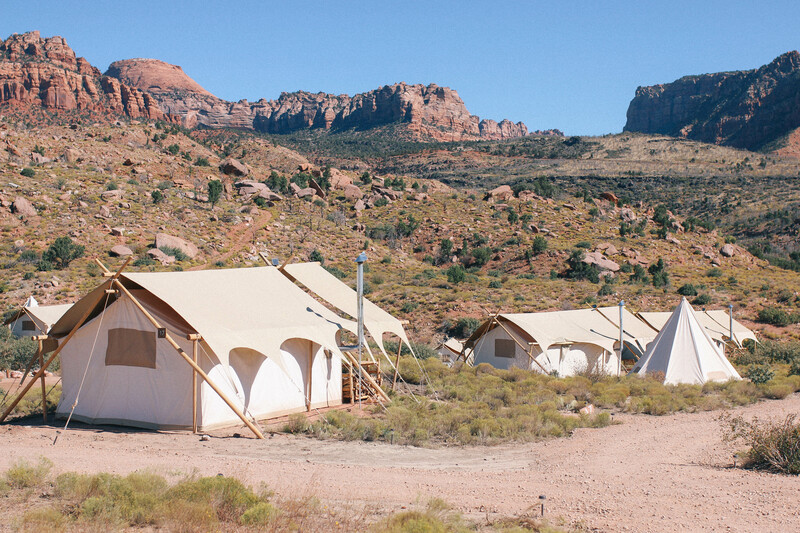 From the entrance you can see all 196-sprawling acres of the camp, which is nestled along the valley of a red rock canyon boarding Zion National Park. The dirt road from the main entrance takes you throughout the lower portion of the camp and leads to the communal tent which, oddly enough, looks a lot like the ‘cornucopia’ on Hunger Games, haha. Wouldn’t you agree? The communal tent, or cornucopia, as we had everyone calling it by the end of our stay, is where guests check-in. 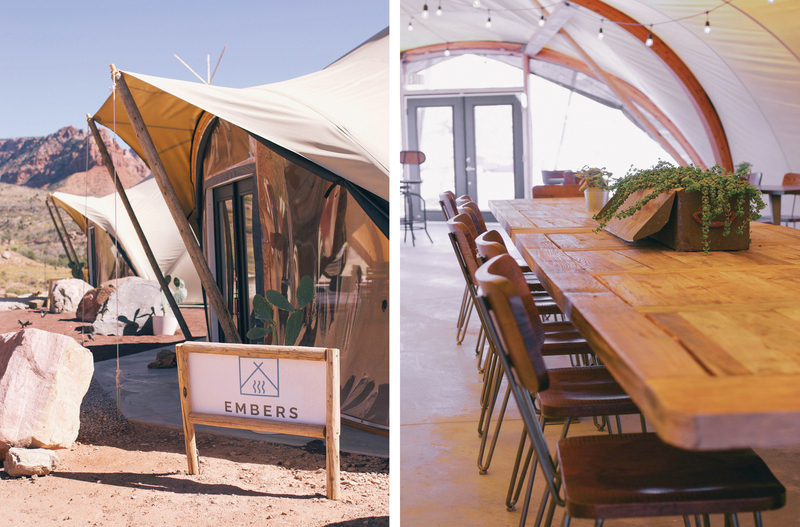 It also houses the onsite restaurant, Embers, which is a campfire inspired dining experience. 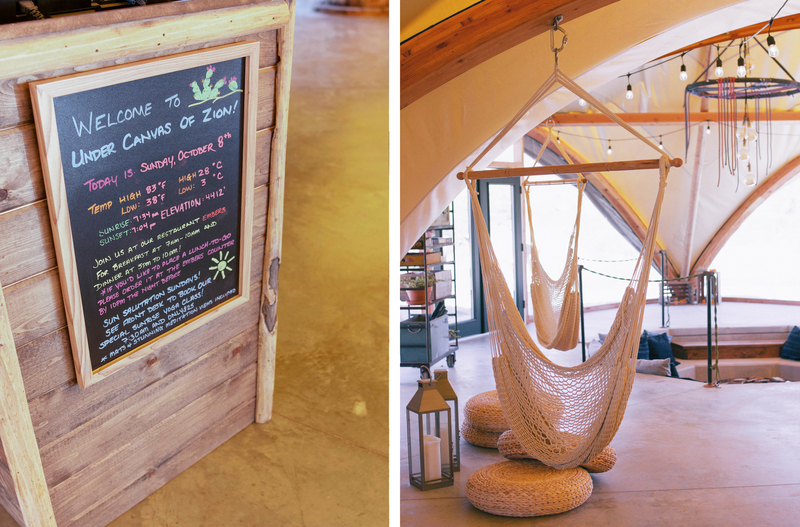 Their menu features locally sourced ingredients and serves breakfast and dinner everyday. Each day I had the homemade granola & oatmeal and the fresh kale salad! Though part of Under Canvas, you pay for each meal at the time in which your order is placed. 🙂 There is complementary coffee, tea, water and hot chocolate available throughout the day, so don’t forget to bring your water bottle and/or thermos! 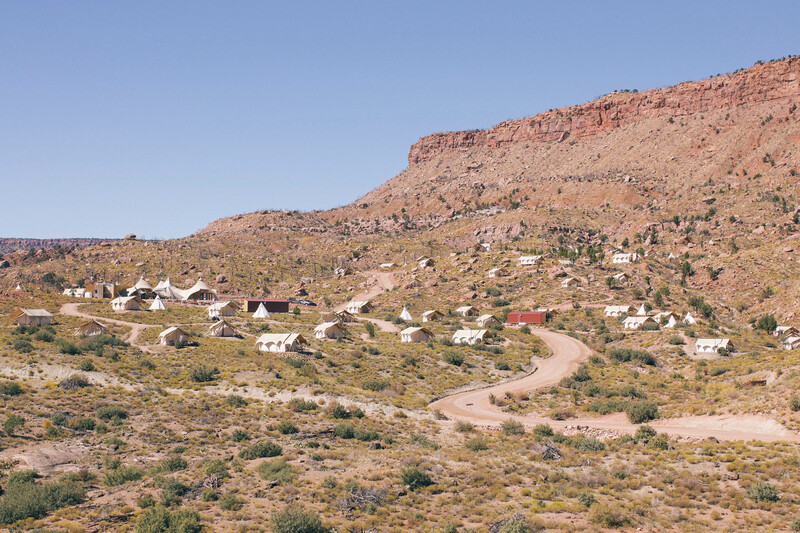 Upon arrival we were greeted by the sweetest staff and taken to our tent located high on the canyon. 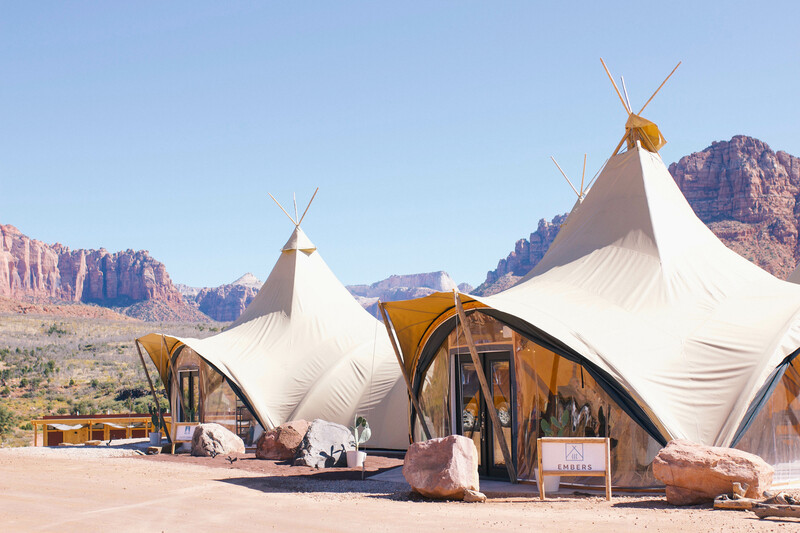 The tents are made of thick white canvas and have “front doors” that can be zipped closed to the elements or tied back to create an indoor/outdoor luxury camping space. 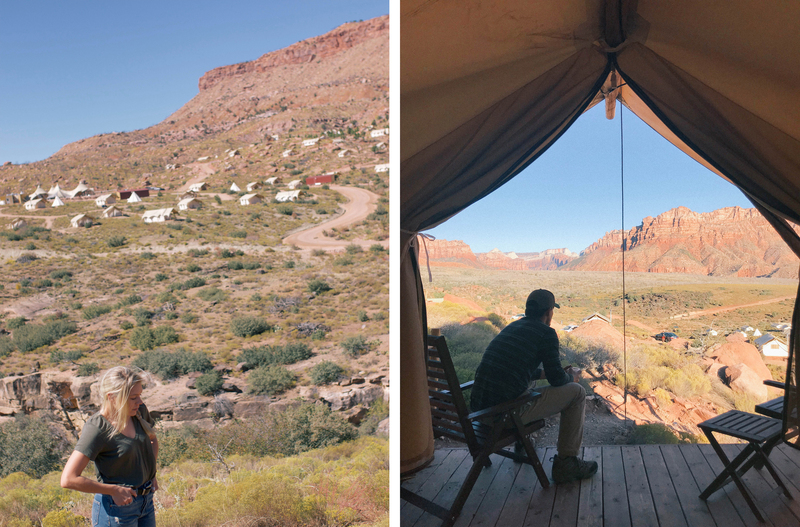 We stayed in the deluxe tent, which offered a private deck, in-suite bathroom (I share more on that in a Q & A below) and the most incredible view of the surrounding canyons. Every evening we would set on our deck and enjoy a glass of wine while watching the sun fall behind the red rock canyons. The sunsets out West are some of the most magical, and it’s quite sublime to experience total privacy in the middle of the open wildness. 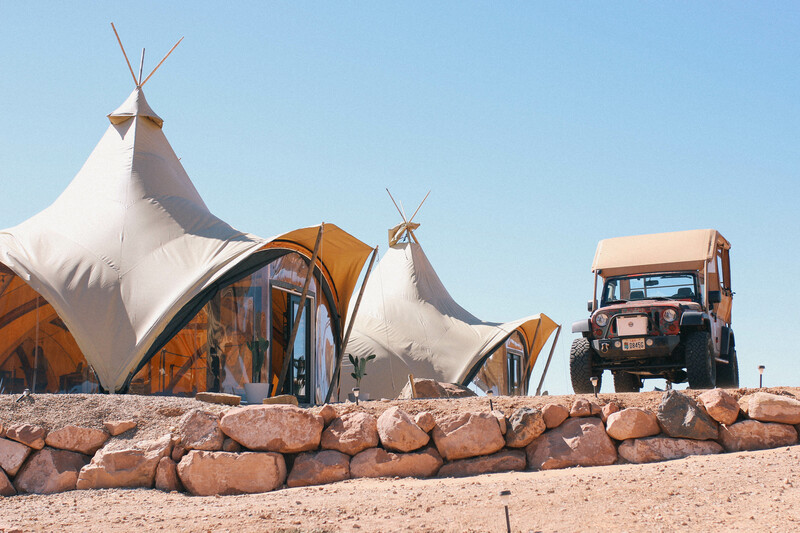 Canyoneering, helicopter rides, hot air ballooning and safari jeep tours are among the variety of activities available through Under Canvas Adventures! It’s recommended that guests schedule activities in advance, preferably when booking accommodations, however we found the on-site staff were always eager to assist with any last minute requests. 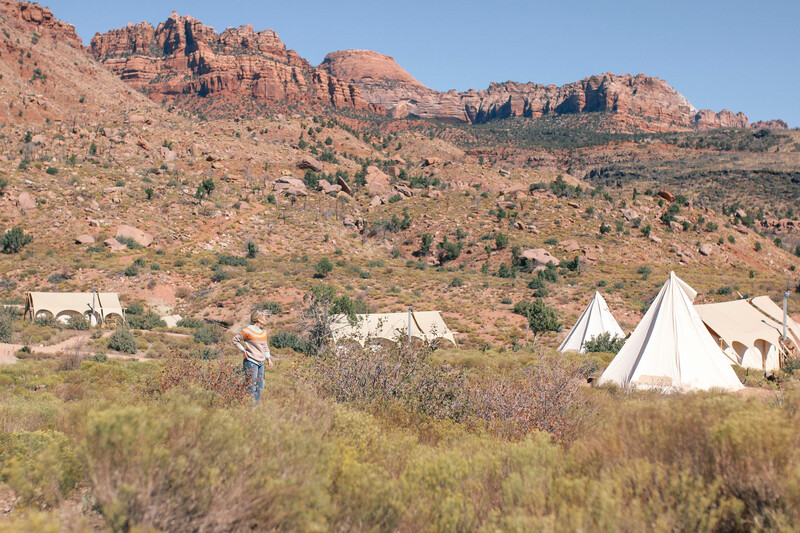 While guests at Under Canvas, Justin and I opted to spend our days exploring Zion National Park. We hiked Angels Landing Trail, one of the most thrilling hikes I’m confident I will ever experience! The last half-mile of the hike requires the use of support chains anchored into the edge of the canyon, as the trail is only a few feet wide in some areas with sheer drop-offs on either side (later on the shuttle we learned those drop-offs were nearly 1,500 feet high, which was elevation gained during the hike…). On our second day we experienced a portion of The Narrows Trail. I will share more on those two hikes in a later post detailing our entire trip (suggested time of day to visit, tips for parking, how to dress, etc.) and I will circle back to update this post with that direct link. On our last night at Under Canvas we experienced a wind storm with up to 60 mile an hour wind gusts. 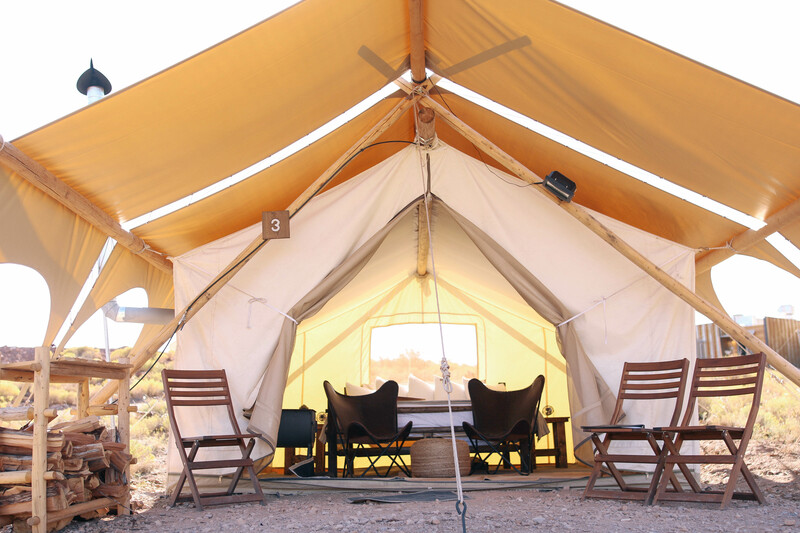 Being in a canvas tent, it was a bit terrifying and yet exciting at the same time. Though we would have been fine in our tent, we took shelter in the communal area where had dinner at Embers and played card games with other guests. We met so many interesting, like-minded people, which we felt was all part of the experience at Under Canvas. 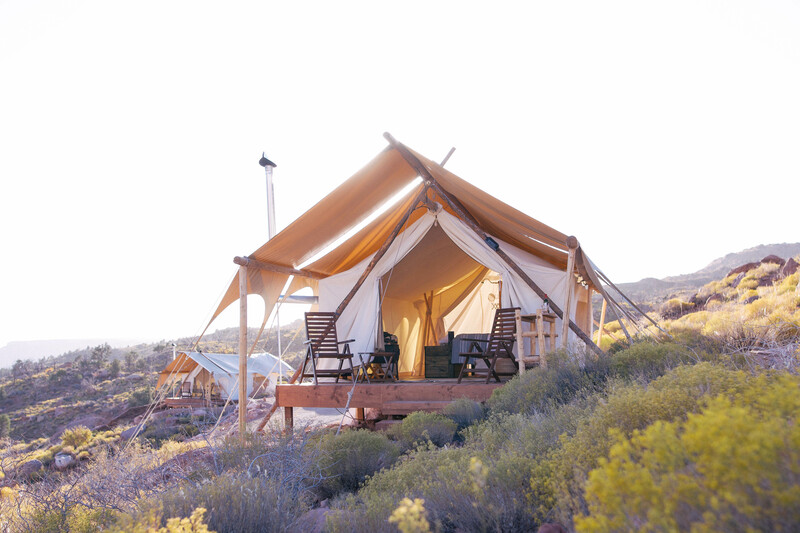 It’s private and yet designed in a way that makes it easy to meet other guests: around the fire at night, when dining at Embers family style tables or when walking around the camp. If you plan on visiting the Midwest, I recommend you consider staying at one of the five Under Canvas properties! I have to give my husband all the credit for discovering this one; he’s great at uncovering the coolest locations. Below I answered a few of the questions I received throughout our stay. Please let me know if you have any additional questions! Later in the week I will be sharing a complete review of our trip in addition to a Jackson Hole Travel Guide! Do the tents have a toilet? Some do, yes! 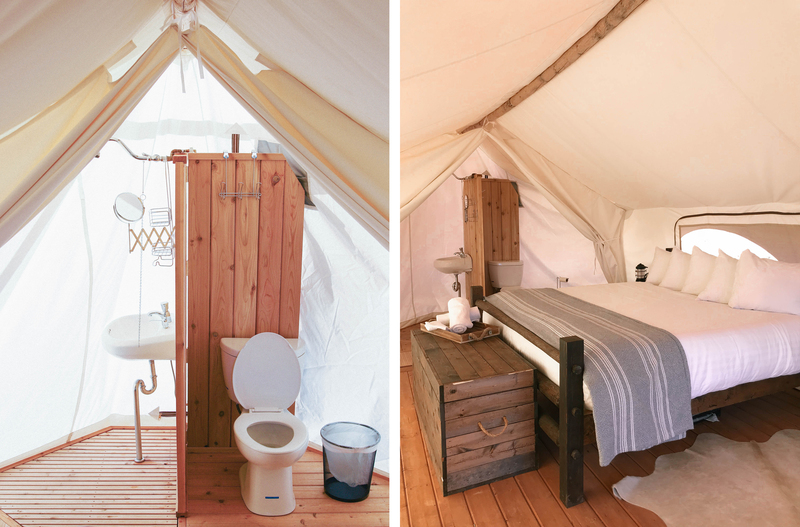 The Deluxe, Stargazer and Suite Tents all have in-suite private bathrooms with flushing toilets, sinks and hot showers! We stayed in the deluxe tent and the bathrooms were equipped with push button faucets and pull chain shower heads (you simply pull the chain to get wet, release, soap up and pull the chain again to rinse off). This is very similar to showering outside although the temperature most mornings and evenings was nearly 30 degrees, so before showing we would start a fire and close the tent to trap the heat. 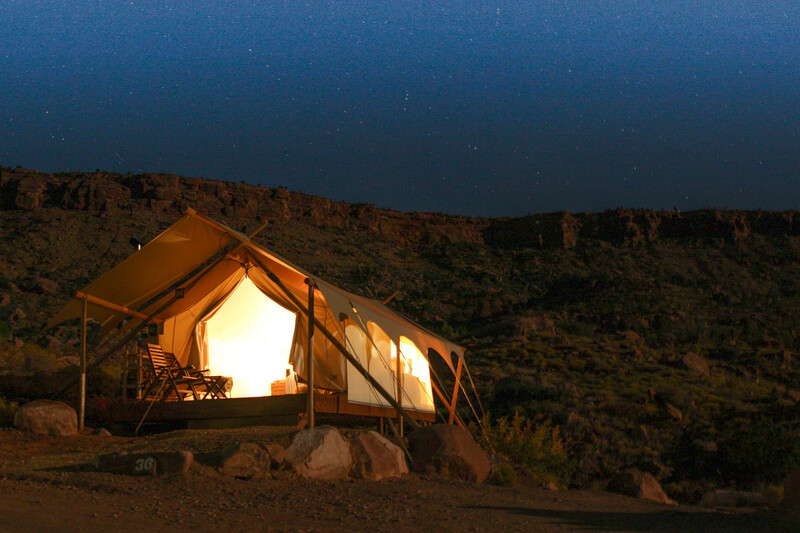 The Safari Tent’s offer a bed and wood burning stove and are within feet of a luxury bath-house that has six private units (for those of you wondering, a toilet, shower, sink, mirror and electrical outlet are in each unit). Each day I would head down to the communal bath to dry my hair. Do the tents have electricity? There is no electricity throughout the camp. It’s glamping! 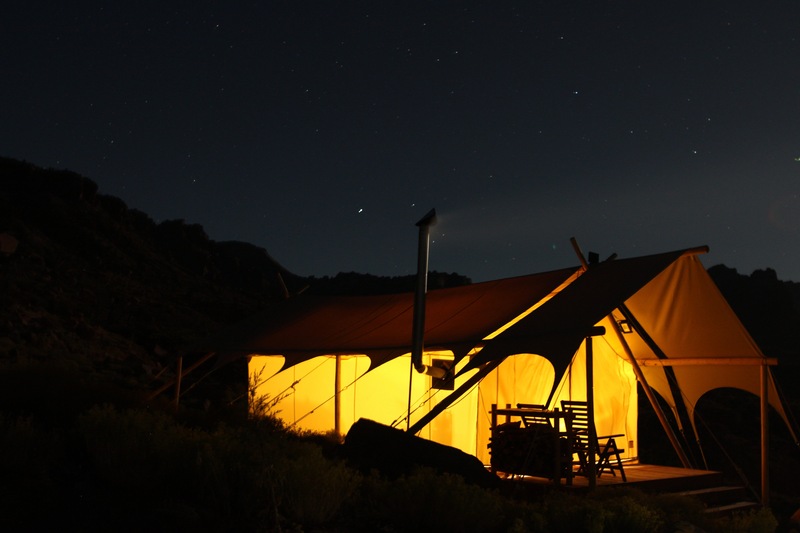 The pathways at night are well lit with solar lights and each tent is equipped with two lanterns and two fans that plug into the USB port of an external charger (there are two in each tent). This is also used to charge your phone, so don’t forget your USB cord. The communal bath-house is also well lit throughout the night for Safari Tent goers. Pro tip: There is a hidden charging station available in the common area for the electronics you absolutely cannot live without. Are the tents heated/ air-conditioned? 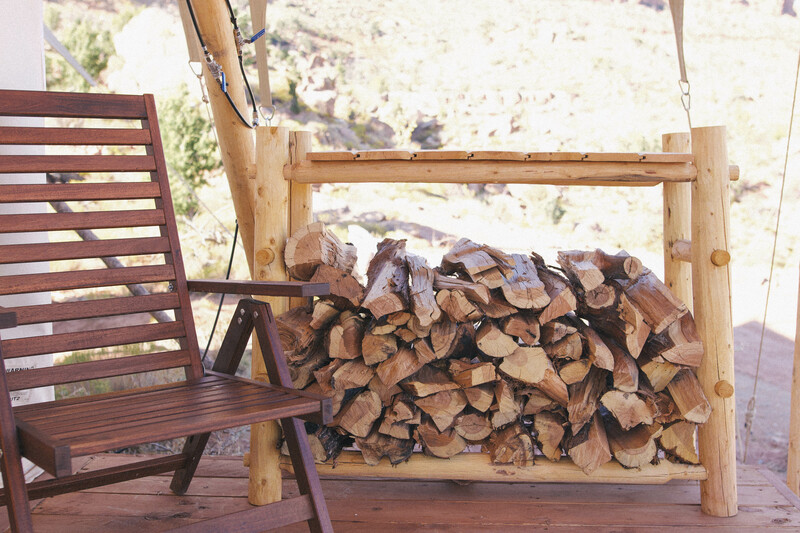 Not exactly… A wood burning stove and firewood are provided in each tent! There is also a mist system to keep you cool in warmer months (we initially assumed this was a fire sprinkler system and later learned it was mister – how neat?!). 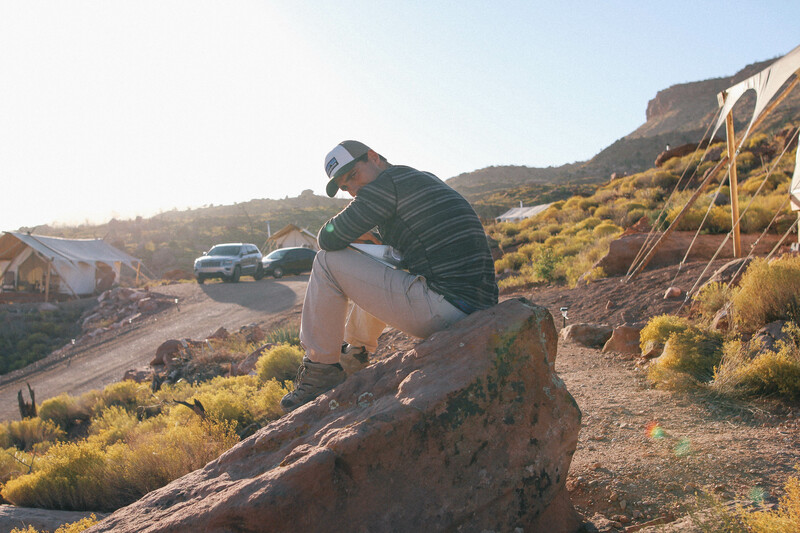 The desert undergoes extreme changes within a short period of time, so pack accordingly! Layers are key! Take a look at the weather beforehand. Layers are key when visiting the desert. For example, the temperatures were in the mid-30’s most mornings and nights, and mid-70’s throughout the day. Jeans, hiking boots, fleece jackets, t-shirts, athletic wear and pull-overs are my top recommendations. Does the camp provide meal options? Yes! There is a restaurant located in the communal tent that offers an amazing variety of healthy options for breakfast and dinner. Most guests adventure off-camp during the day and eat lunch out and about. This place looks amazing! Looks like such a unique experience! 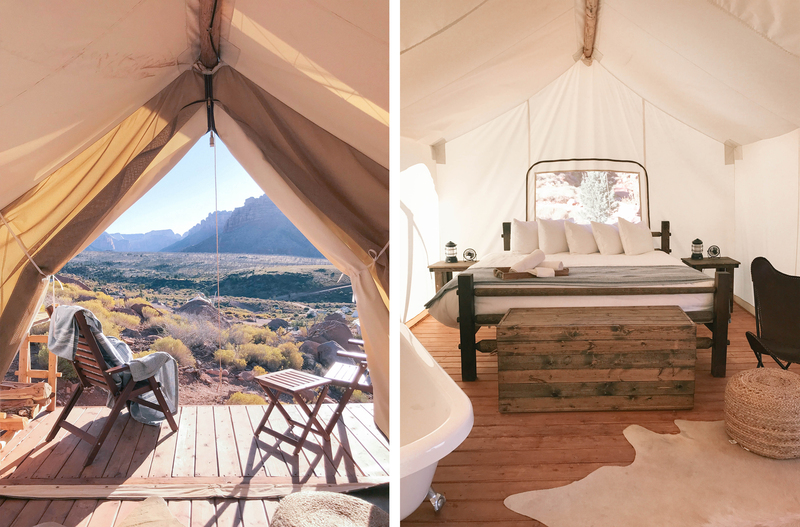 Thanks for sharing all of the details with us… I am dying to visit anywhere out west!